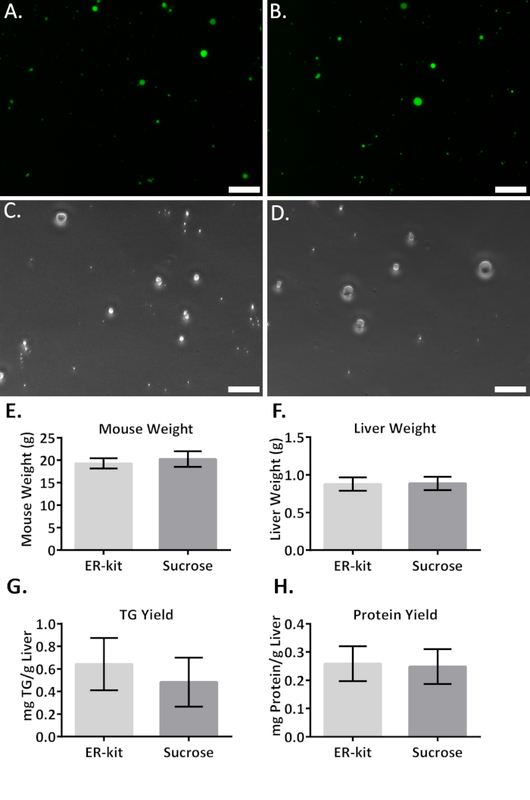 This protocol establishes a novel method of lipid droplet isolation and purification from mouse livers, using a well-established endoplasmic reticulum isolation kit. 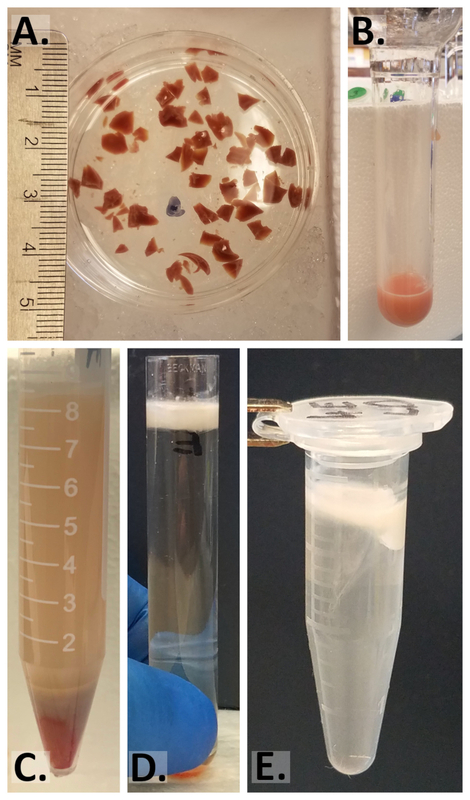 Brettschneider, J., Correnti, J. M., Lin, C., Williams, B., Oranu, A., Kuriakose, A., McIver-Jenkins, D., Haba, A., Kaneza, I., Jeon, S., Scorletti, E., Carr, R. M. Rapid Lipid Droplet Isolation Protocol Using a Well-established Organelle Isolation Kit. J. Vis. Exp. (146), e59290, doi:10.3791/59290 (2019). Lipid droplets (LDs) are bioactive organelles found within the cytosol of the most eukaryotic and some prokaryotic cells. LDs are composed of neutral lipids encased by a monolayer of phospholipids and proteins. Hepatic LD lipids, such as ceramides, and proteins are implicated in several diseases that cause hepatic steatosis. Although previous methods have been established for LD isolation, they require a time-consuming preparation of reagents and are not designed for the isolation of multiple subcellular compartments. We sought to establish a new protocol to enable the isolation of LDs, endoplasmic reticulum (ER), and lysosomes from a single mouse liver. Further, all reagents used in the protocol presented here are commercially available and require minimal reagent preparation without sacrificing LD purity. Here we present data comparing this new protocol to a standard sucrose gradient protocol, demonstrating comparable purity, morphology, and yield. Additionally, we can isolate ER and lysosomes using the same sample, providing detailed insight into the formation and intracellular flux of lipids and their associated proteins. LDs are bioactive organelles found in the cytosol of most eukaryotic cells and some prokaryotic cells1,2,3. The LD core is composed of neutral lipids such as triglyceride (TG) and cholesterol esters. They also contain ceramides, bioactive lipids involved in cellular signaling pathways4,5. LDs are surrounded by a phospholipid monolayer and coated with proteins, including the perilipin proteins perilipin 2 (PLIN2) and 3 (PLIN3)1,5,6. Also present are lipogenic enzymes, lipases, and membrane trafficking proteins that have been linked to several hepatic steatotic diseases, including nonalcoholic fatty liver disease, alcoholic liver disease, and hepatitis C3,5,6,7,8,9,10. LDs are thought to form from the outer membrane of the ER and contain newly synthesized TG sourced from ER-derived free fatty acids11. However, it remains unknown whether the pooled lipids bud, remain connected, or are excised from the ER6,11, making the isolation of LDs free from ER technically challenging. Free fatty acids can be liberated from LDs by the action of surface lipases to provide for energy production or membrane synthesis. Additionally, LDs can be degraded via lipophagy as a regulatory mechanism and to produce free fatty acids12. Besides the ER and lysosomes, there are other organelles—such as mitochondria, endosomes, peroxisomes, and the plasma membrane—that are found within close association of LDs11. This tight polygamy makes it difficult to perform a pure LD extraction. However, neutral lipids’ innate low density can be taken advantage of via centrifugation5. Traditionally, LDs have been isolated using a sucrose density gradient1,5,13. However, these methods have not been designed to isolate other organelles. Additionally, they require the time-consuming preparation of reagents. This protocol adapts a commercially available ER isolation kit (see the Table of Materials) to allow for LD isolation. We use the extraction buffer provided by the kit, adding an LD isolation step. Furthermore, the protocol can also be used for ER and lysosomal isolation using the same samples, allowing for a more comprehensive image of the life cycle of LDs. To validate this new method, we assay LD yield, morphology, size, and purity. We compare the results presented here to those obtained with a widely used protocol utilizing a sucrose gradient for LD isolation. We used a 10- to 12-week-old, 20 g female C57BL/6 mouse fasted for 16 h (food removal at 5.00 P.M. for a 9.00 A.M. LD isolation time) with free access to water. The typical yield for TG is 0.6 mg/g liver, and for LD protein, it is 0.25 mg/g liver. This provides enough material for ~10 immunoblots by SDS PAGE. The protocol below details the reagents used and a protocol suitable for a single 1 g liver. The sucrose gradient isolation protocol is adapted from Sato14 and Wu15. All experiments were conducted on a laboratory bench with personal protective equipment appropriate for biosafety level 1, including a lab coat, gloves, and safety goggles. Experiments were performed according to the protocols approved by the Institutional Animal Care and Use Committee (IACUC) of the University of Pennsylvania. All efforts were made to minimize animal discomfort, and the animals were treated with humane care. NOTE: The listed amounts are suitable for a single 1 g mouse liver. Prepare 10 mL of 1x isotonic extraction buffer (IE buffer, from the ER isolation kit) by diluting 2 mL of 5x IE buffer with 8 mL of ultrapure water. Cool the buffer by placing it on ice. Prepare 100 mL of 1x phosphate-buffered saline (PBS) by diluting 10 mL of 10x PBS in 90 mL of ultrapure water. Cool it by placing it on ice. Prepare 10 mL of 5% polyethylene glycol p-(1,1,3,3-tetramethylbutyl)-phenyl ether (PGPE) by diluting 500 µL of PGPE in 9.5 mL of ultrapure water. Use a 1 mL syringe to measure out PGPE as it is viscous. Cool it by placing it on ice. Cool all tubes by placing them on ice: 1.7 mL microcentrifuge tubes, 15 mL centrifuge tubes, 50 mL high-speed centrifuge tubes, and 13 mL ultracentrifuge tubes. Cool all required centrifuges to 4 °C: a microcentrifuge, a high-capacity centrifuge for 15 mL tubes, a high-speed centrifuge for 50 mL tubes, and an ultracentrifuge. Sterilize forceps and dissection scissors by autoclaving. Euthanize the mouse by placing it in a chamber filled with 100% CO­2 for 10 min. Confirm euthanasia by performing cervical dislocation. Using sterile forceps and dissection scissors, cut the skin and muscle layers of the abdomen on the posterior/anterior axis to expose the liver. Cut the ligaments connecting the liver to the diaphragm and intestine. Use forceps to pull the intestine away from the liver, toward the posterior, to expose the ligaments. Cut between the liver and the dorsal ribcage, moving from anterior to posterior until the liver is liberated. Transfer the liver to a cold 5 cm Petri dish with 10 mL of cold 1x PBS. Wash the liver 2x on a rocking platform in 10 mL of cold 1x PBS for 5 min at 4 °C in the 5 cm Petri dish. Pour off 1x PBS after the final wash.
Use a size-10 sterile surgical blade (see the Table of Materials) to dice the liver into 3–5 mm pieces in the 5 cm Petri dish (Figure 1A). Wash the diced liver 2x with 10 mL of cold 1x PBS for 5 min at 4 °C in the 5 cm Petri dish. NOTE: For lysosome isolation, transfer 0.5 g of liver to a clean 45 mL homogenizer and follow the directions supplied by the lysosome extraction kit (see the Table of Materials). Decant 1x PBS and transfer the diced liver pieces to the cold 45 mL Dounce homogenizer. Ensure all pieces go to the bottom of the homogenizer. Add 7 mL of cold 1x IE buffer (from the ER isolation kit) and homogenize on ice by moving the pestle up and down 20x. Ensure that the pestle goes to the bottom of the homogenizer during each stroke. Transfer the homogenate (Figure 1B) to a cold 15 mL centrifuge tube. Rinse the homogenizer with 1 mL of cold 1x IE buffer (from the ER isolation kit) and add this to the rest of the homogenate. Remove nuclei by centrifuging the homogenate in a high-capacity centrifuge at 1,000 x g for 10 min at 4 °C (Figure 1C). Transfer the postnuclear supernatant (PNS) to a new, cold 50 mL centrifuge tube. To prevent LD loss, ensure that any lipid gathered at the top of the 15 mL tube is resuspended before transferring the PNS. Take a 100 µL aliquot of the PNS for purity analysis and place it in a cold 1.7 mL microcentrifuge tube. Set it aside on ice. To remove mitochondria, centrifuge the PNS sample, not the aliquot, in a refrigerated high-speed centrifuge at 12,000 x g for 15 min at 4 °C. Optional: For crude LD (CLD) isolates (with cytosol and cell membrane contamination), collect the top lipid layer using a glass pipette and transfer it to a 1.7 mL microcentrifuge tube. Continue to section 1.4. Transfer the postmitochondrial supernatant (PMS) to an ultracentrifuge tube. To prevent LD loss, ensure that any lipid gathered at the top is resuspended before transferring the PMS. Take a 100 µL aliquot of the PMS for purity analysis and place it in a cold 1.7 mL microcentrifuge tube. Set it aside on ice. Fill an ultracentrifuge tube to the brim with cold 1x IE buffer to prevent the tube collapsing during ultracentrifugation. Balance the samples and centrifuge them in an ultracentrifuge at 100,000 x g for 60 min at 4 °C (Figure 1D). To remove the LD layer, tilt the tube at a 45° angle and use a glass pipette to aspirate. Transfer the pellet to a cold 1.7 mL microcentrifuge tube. NOTE: The pellet contains isolated ER. Use this fraction downstream for ER isolation. Collect 100 µL of the post-ER supernatant (PER) under the lipid layer for purity analysis. Add 1x PBS to the LD fraction collected in a 1.7 microcentrifuge tube, to a total volume of 1.3 mL. Centrifuge in a microcentrifuge at top speed for 5 min at 4 °C to pellet any cell debris. Warm the tube gently with hands to help resuspend the LD layer. Transfer the supernatant, including the lipid layer, to a new 1.7 mL microcentrifuge tube. Repeat steps 1.4.1–1.4.3 2x–3x, until the pellet is no longer visible. Add 1x PBS to the pellet-free LD supernatant to a final volume of 1.5 mL. Wash the lipid fraction by centrifugation in a microcentrifuge at top speed for 5 min at 4 °C. Remove 1 mL of 1x PBS (underneath the lipid layer) with a glass pipette without disturbing the lipid layer. Repeat steps 1.4.5 and 1.4.6 4x–5x, until the 1x PBS is visually transparent with no turbidity. Remove all 1x PBS below the lipid layer, using a glass pipette (Figure 1E). Use the result, a pure LD fraction, for downstream analysis. NOTE: Do not use a bicinchoninic acid assay (BCA) if LD morphology is to be assessed. Resuspend the LD in 500 μL of 5% PGPE. Boil the samples for 5 min at 95 °C, vortex them, and incubate the samples at room temperature for 5 min to cool. Repeat step 1.5.2 an additional 2x. Sonicate the samples for 5 min with a 30 s on/off cycle, at medium intensity. Normalize the samples by measuring the protein concentration in all purity analysis samples and in the LD fraction by BCA assay. Make 200 mL of TE buffer (10 mM Tris-HCl [pH 7.4], 1 mM EDTA [pH 8.0]). Cool it by placing it on ice. Make 100 mL of 60% (w/v) sucrose solution in TE buffer by dissolving 60 g of sucrose in TE buffer, bringing the final volume to 100 mL. Cool it by placing it on ice. Make 6 mL of 40% (w/v) sucrose solution by adding 4 mL of 60% sucrose to 2 mL of TE buffer. Cool it by placing it on ice. Make 6 mL of 25% (w/v) sucrose solution by adding 2.5 mL of 60% sucrose to 3.5 mL of TE buffer. Cool it by placing it on ice. Make 4 mL of 10% (w/v) sucrose solution by adding 0.7 mL of 60% sucrose to 3.3 mL of TE buffer. Cool it by placing it on ice. Make 10 mL of protease and phosphatase inhibitor solution by adding one tablet of both protease and phosphatase inhibitors to 10 mL of TE buffer. Prepare tissue homogenate buffer by adding 4 mL of protease and phosphatase inhibitor solution to 50 mL of 60% sucrose stock solution. Cool it by placing it on ice. Prepare overlay buffer by adding 2 mL of protease and phosphatase inhibitor solution to 50 mL of TE buffer. Cool it by placing it on ice. Prepare 100 mL of 1x PBS by diluting 10 mL of 10x PBS in 90 mL of ultrapure water. Cool it by placing it on ice. Prepare 10 mL of 5% PGPE by diluting 500 µL of PGPE in 9.5 mL of ultrapure water. Use a 1 mL syringe to measure out PGPE as it is viscous. Cool it by placing it on ice. Cool the following centrifuge tubes by placing them on ice: 1.7 mL microcentrifuge tubes, 15 mL centrifuge tubes, 50 mL high-speed centrifuge tubes, and 13 mL ultracentrifuge tubes. Cool the required centrifuges to 4 °C: a microcentrifuge, a high-capacity centrifuge (for 15 mL tubes), a high-speed centrifuge (for 50 mL tubes), and an ultracentrifuge. Use steps 1.2.1–1.2.9 to prepare the tissue for homogenization. Add 7 mL of cold tissue homogenate buffer and homogenize it on ice by moving the pestle up and down 20x. During the first five strokes, ensure the pestle goes to the bottom of the homogenizer. Transfer the homogenate to a cold 15 mL centrifuge tube. Rinse the homogenizer with 1 mL of cold tissue homogenate buffer and transfer it to the previously used 15 mL centrifuge tube. Bring the volume of the homogenate up to 10 mL with tissue homogenate buffer. Centrifuge the sample in a high-capacity centrifuge at 1,000 x g for 10 min at 4 °C. Transfer 8 mL of supernatant to a 50 mL centrifuge tube. Transfer 100 µL of the remaining supernatant as PNS sample for purity analysis. Tilt the 50 mL centrifuge tube containing the 8 mL of PNS at a 45° angle. Carefully add 6 mL of 40% sucrose solution, ensuring the two phases stay separate. In a similar fashion, slowly add 6 mL of 25% sucrose solution; then, add 4 mL of 10% sucrose solution; finally, add 8 mL of overlay buffer. Centrifuge the sample in a high-speed centrifuge at 30,000 x g at 4 °C for 30 min. Transfer the top layer containing the LDs to a 1.7 mL microcentrifuge tube. For LD washing, follow the steps in section 1.4. We have performed the LD isolation with the ER kit on approximately 30 mice and compared the results with those following the sucrose isolation protocol on approximately 40 mice. The reported findings are typical for both protocols. Mice were fasted overnight with free access to water, to increase the LD yield. LD isolation using a sucrose gradient was run in parallel with the ER kit LD isolation protocol. Samples of PNS, PMS, PER, CLDs, and LDs were collected throughout the ER kit LD isolation protocol. Due to workflow restriction of the sucrose isolation protocol, only the PNS and LD isolate were collected. For fluorescent microscopy, 50 µL of isolated LDs were mixed with an equal volume of 100 µM 4,4-Difluoro-1,3,5,7,8-Pentamethyl-4-Bora-3a,4a-Diaza-s-Indacene (DPBDI). Samples were protected from light and incubated at room temperature for 30 min. The samples were washed by adding 1 mL of 1x PBS, followed by centrifugation and removal of excess buffer. Of the LD fraction, 1 µL was placed onto a microscope slide and coverslipped. Representative 20x fluorescent and brightfield LD images were taken from both the ER kit LD isolation and the sucrose LD isolation (Figure 2A-D) methods, using an inverted research microscope (see the Table of Materials). The brightfield images reveal similar levels of particulate matter, suggesting similar purities using the different protocols. To determine differences in yield between the two protocols, we used comparably sized mice and mouse livers (Figure 2E,F). Following purification, LD TG and protein levels were measured using colorimetric assays (see the Table of Materials) and the data were normalized to liver weight (Figure 2G,H). We found, when we normalized the starting material, that the LD protein and TG yield after LD isolation using the ER kit and sucrose were similar. To determine if the LD size was also similar, we quantified LD diameters using image analysis software (see the Table of Materials). LDs ranged from 0.27 to 6.37 µm. The frequency distribution of LD diameter shows that the ER kit LD isolation (Figure 3A) and sucrose LD isolation (Figure 3B) yield LDs of similar sizes. To assess LD purity, the samples were assayed by immunoblotting. An amount of 20 µg of protein per sample was assayed by SDS PAGE. The samples were probed with antibody markers for LDs (PLIN2 and PLIN3), ER (Sec61), mitochondria (VDAC), lysosomes (LAMP1), plasma membrane (MEK1), nuclei (histone H3), and cytosol (GAPDH) (Figure 4A). PLIN2 was detected in all samples except for the ER kit LD isolation PER and the sucrose’s PNS. The LDs derived from the ER kit LD isolation and the sucrose gradient protocol both had equal purity. No bands appeared for the ER (Sec61), mitochondria (VDAC1), lysosomes (LAMP1), plasma membrane (Mek1), or the cytosol (GAPDH). The CLD had plasma membrane and cytosol contamination but no apparent contamination from the ER, mitochondria, or lysosomes. The intensity of the PLIN2 band in the adapted ER protocol indicates that the ER protocol had an approximately 14-fold higher PLIN2 expression in the LD fraction compared with the PNS, while the sucrose protocol had a sixfold higher PLIN2 expression in the LD fraction (data not shown). Because this protocol also has the option to purify ER and lysosomes, we also performed western blotting to assess the purity of these organelles. Figure 4B shows that the immunoblots of purified ER from the same sample using the ER kit (see the Table of Materials) were free of PLIN2 but had significant levels of the ER Sec61A protein. 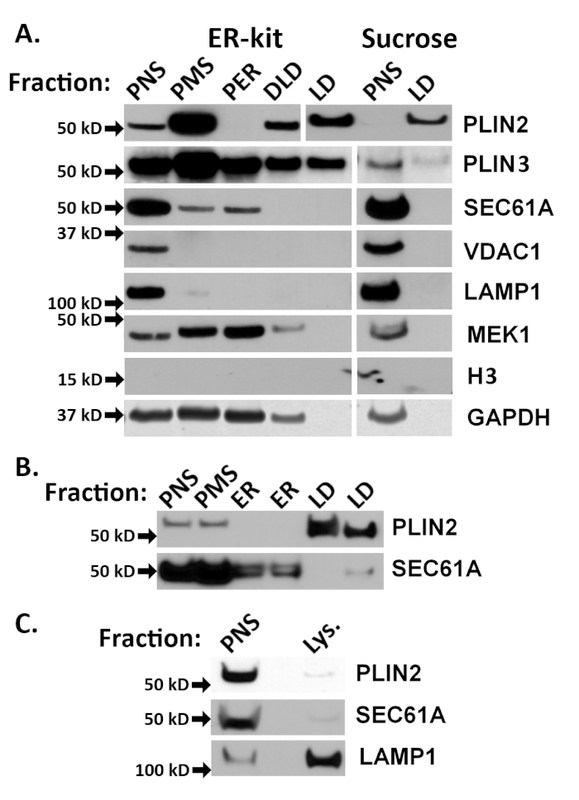 Using the lysosomal enrichment kit (see the Table of Materials), lysosomes were further isolated and immunoblotted for LD (PLIN2), ER (Sec61A), and lysosome (LAMP1) markers (Figure 4C). Together, these data show that the protocol presented here, in combination with commercially available lysosome purification kits, allow for the pure isolation of liver LDs, ER, and lysosomes from a single animal. Figure 1: Reference pictures taken during the LD isolation using an ER isolation kit. (A) Diced 5 mm liver pieces in a 5 cm Petri dish. (B) Liver homogenate after homogenization in a Dounce homogenizer. (C) Liver homogenate after centrifugation at 1,000 x g; note the slight lipid layer on top, the PNS, and the pellet containing cell debris and nuclear fraction. (D) LD layer after ultracentrifugation at 100,000 x g; note the prominent lipid layer on top, the PER, and the ER fraction on the bottom. (E) Washed LD fraction before the final removal of the PBS. Please click here to view a larger version of this figure. 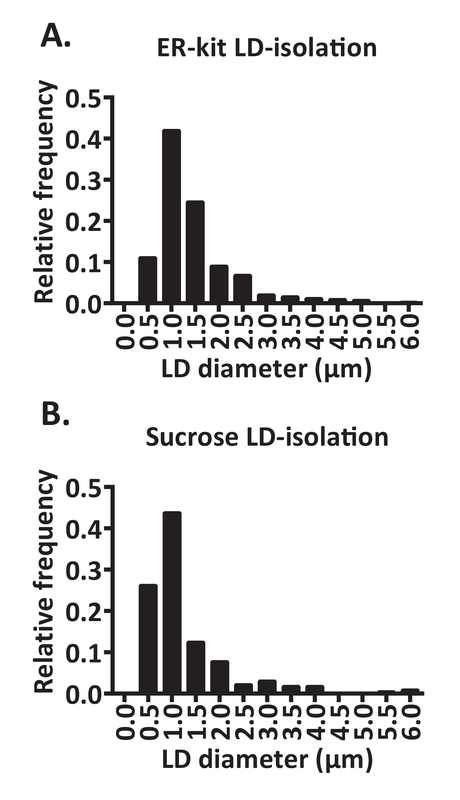 Figure 2: Micrograph and quantitative analysis comparing the LD fraction isolated with an ER kit and the LD fraction isolated with sucrose. Representative 20x fluorescent micrograph of (A) a DPBDI-stained LD fraction isolated with an ER kit and (B) LDs isolated with sucrose. (C) Brightfield micrograph of the LD fraction isolated with an ER kit and (D) the LD fraction isolated with sucrose. The scale bar = 20 µm. (E) Mouse weight and (F) liver weight. (G) TG yield from purified LDs normalized to liver weight. (H) Protein yield from purified LDs normalized to liver weight. The data are mean ± SEM (N = 4). Please click here to view a larger version of this figure. Figure 3: Frequency distribution of LD sizes. Samples from four different mice were stained with DPBDI and representative 20x fields were quantified. The diameters were measured using an image analysis software. (A) Frequency (fraction) distribution of an LD fraction isolated using an ER-kit. (B) Frequency (fraction) distribution of an LD fraction isolated using sucrose gradient density. Please click here to view a larger version of this figure. Figure 4: Analysis of LD purity by immunoblotting. (A) To compare the adapted protocol of the ER kit LD isolation and the sucrose isolation protocol, 20 µg of protein per sample was immunoblotted. The following samples were loaded: postnuclear supernatant (PNS), postmitochondrial supernatant (PMS), postendoplasmic reticulum supernatant (PER), crude LDs (CLD), and LDs (LD). Samples were immunoblotted for LDs (PLIN2 and PLIN3), ER (SEC61A), mitochondria (VDAC1), lysosome (LAMP1), cell membrane (MEK1), nuclei (histone H3) and cytosol (GAPDH) markers. (B) Purity analysis of an ER fraction after further purification of the ER using the ER kit LD isolation protocol (see the Table of Materials). PNS, PMS, ER, and LDs were loaded and immunoblotted for LDs (PLIN2) and ER (SEC61A). (C) Purity analysis of a lysosomal fraction after further purification of lysosomes using the lysosome enrichment kit protocol (see the Table of Materials). PNS and a lysosomal fraction were loaded and immunoblotted for LDs (PLIN2), ER (SEC61A), and lysosomes (LAMP1). Please click here to view a larger version of this figure. Hepatic LD biology is increasingly being recognized as a critical regulator of hepatocellular physiology in both health and disease. As bona fide organelles, LDs are dynamic, interact with other cellular structures, and contain within them bioactive components involved in both lipid and glucose homeostasis. The sucrose gradient is routinely used for LD isolation and enables investigators to study LD structure, but it requires them to make numerous buffers. We have demonstrated that the use of a commercially available ER isolation kit is another tool that can be used for not only LD isolation but for tandem isolation of ER and lysosome, allowing for a more comprehensive view of cellular dynamics in response to varying experimental conditions, without significant increase in workflow. The strength of this new protocol is its ease of setup using commercially or readily available reagents and its ability to isolate multiple organelles simultaneously. However, there are potential drawbacks to this new method to keep in mind. Several steps in this protocol may disadvantage the isolation of supersized LDs from the liver. Dounce homogenization has the potential to disrupt large LDs through shear stress. A loosely fitting Dounce homogenizer setup may alleviate some of the stress to large LDs. Additionally, a 100,000 x g spin is employed, allowing for the separation of LD and ER. This speed may also cause a loss of large LDs, as one report recommends 2,000 x g for liver LD purification2. One limitation of this procedure is that it cannot be used to isolate LDs of different sizes as recently described16. Additionally, although sucrose buffers can keep fragile LDs intact through the use of gentle homogenization2, homogenizing with 1x IE buffer yields pure LDs with similar morphology and size distribution as those derived from sucrose gradient isolation. Further study will be needed to determine if the biological activity is affected by the use of a PBS buffer, which is less gentle than commonly used isotonic buffers2. Because of these potential limitations, it is critical during the first two centrifuge steps to fully resuspend the lipid collected at the top before transferring supernatant and to determine empirically the effect of the stroke number on the LD yield for different tissues. The liver protocol presented here uses 20 strokes, yielding a comparable size distribution to other published work2. LD isolation using the endoplasmic reticulum isolation kit yields both crude and pure LD isolates. CLD isolates contain cell membrane and cytosol components but may prove sufficient for some applications, such as the evaluation of LD morphology with microscopy. The pure LD isolate, as determined by PLIN2 expression, lacks ER, mitochondrial, lysosomal, cell membrane, or cytosol contamination. Indeed, the pure isolate from the ER kit LD isolation protocol enriches PLIN2 more than twofold compared with the sucrose LD isolation method. This difference was unexpected, given the similarity in protein and TG yield, but may be due to the use of PBS as a resuspension buffer as opposed to sucrose or isotonic buffer. LD isolation by traditional methods can also suffer from contamination of the LD fraction by the plasma membrane2. Although this co-isolation is common in all LD isolation methods and should be kept in mind when analyzing LD isolates2, the data presented here demonstrate that further ultracentrifugation of the CLD isolate rids the sample of such contaminants (Figure 4). Future adaptations can include the use of a French press or nitrogen bomb to disrupt the cell membrane more gently and further reduce any contamination of the CLD isolate2. In conclusion, the ER kit LD isolation method is a novel application of a commonly used cellular biology tool. This method performs similarly to sucrose gradient isolation, with less reagent preparation. In addition, the inclusion of prepared reagents in the ER kit LD isolation protocol improves the rigor and reproducibility of experimental conditions. Dr. Carr receives research support from Intercept Pharmaceuticals. We thank the Abramson Family Cancer Research Institute. This work is supported by following grants: NIH/NIAAA R01 AA026302-01, NIH/NIAAA K08-AA021424, Robert Wood Johnson Foundation, Harold Amos Medical Faculty Development Award, 7158, IDOM DRC Pilot Award P30 DK019525 (R.M.C. ); NIH/NIAAA F32-AA024347 (J.C.). This work was supported in part by NIH P30-DK050306 and its core facilities (Molecular Pathology and Imaging Core, Molecular Biology/Gene Expression Core, and Cell Culture Core) and its pilot grant program. The content is solely the responsibility of the authors and does not necessarily represent the official views of the National Institutes of Health. Blunt Nosed Needle 1 ea. Brasaemle, D. L., Wolins, N. E. Isolation of Lipid Droplets from Cells by Density Gradient Centrifugation. Current Protocols in Cell Biology. 72, (2016). Ding, Y., et al. Isolating lipid droplets from multiple species. Nature Protocols. 8, (1), 43-51 (2013). Gao, Q., Goodman, J. M. The lipid droplet-a well-connected organelle. Frontiers in Cell and Developmental Biology. 3, 49 (2015). Correnti, J. M., et al. Ethanol and C2 ceramide activate fatty acid oxidation in human hepatoma cells. Scientific Reports. 8, (1), 12923 (2018). Williams, B., et al. A novel role for ceramide synthase 6 in mouse and human alcoholic steatosis. FASEB Journal. 32, (1), 130-142 (2018). Carr, R. M., Ahima, R. S. Pathophysiology of lipid droplet proteins in liver diseases. Experimental Cell Research. 340, (2), 187-192 (2016). Carr, R. M., et al. Perilipin Staining Distinguishes Between Steatosis and Nonalcoholic. Steatohepatitis in Adults and Children. Clinical Gastroenterology and Hepatology. 15, (1), 145-147 (2017). Carr, R. M., et al. Reduction of TIP47 improves hepatic steatosis and glucose homeostasis in mice. American Journal of Physiology: Regulatory, Integrative and Comparative Physiology. 302, (8), R996-R1003 (2012). Carr, R. M., Peralta, G., Yin, X., Ahima, R. S. Absence of perilipin 2 prevents hepatic steatosis, glucose intolerance and ceramide accumulation in alcohol-fed mice. PLoS One. 9, (5), e97118 (2014). Tsai, T. H., et al. The constitutive lipid droplet protein PLIN2 regulates autophagy in liver. Autophagy. 13, (7), 1130-1144 (2017). Guo, Y., Cordes, K. R., Farese, R. V. Jr, Walther, T. C. Lipid droplets at a glance. Journal of Cell Science. 122, (Pt 6), 749-752 (2009). Liu, K., Czaja, M. J. Regulation of lipid stores and metabolism by lipophagy. Cell Death and Differentiation. 20, (1), 3-11 (2013). Mannik, J., Meyers, A., Dalhaimer, P. Isolation of cellular lipid droplets: two purification techniques starting from yeast cells and human placentas. Journal of Visualized Experiments. (86), e509814 (2014). Sato, S., et al. Proteomic profiling of lipid droplet proteins in hepatoma cell lines expressing hepatitis C virus core protein. Journal of Biochemistry. 139, (5), 921-930 (2006). Wu, C. C., Howell, K. E., Neville, M. C., Yates, J. R. 3rd, McManaman, J. L. Proteomics reveal a link between the endoplasmic reticulum and lipid secretory mechanisms in mammary epithelial cells. Electrophoresis. 21, (16), 3470-3482 (2000). Zhang, S., et al. Morphologically and Functionally Distinct Lipid Droplet Subpopulations. Scientific Reports. 6, 29539 (2016).